Faced with German claims about the "Thousand-year Reich", the Allies first answered with the "Special Operations Executive"...as much to challenge those claims as for any military value. Churchill's directive, "Set Europe Ablaze," had grand sound to it, but many felt that the diversion of crack military personnel would be a waste - Churchill's penchant for disastrous side-shows pre-dated Gallipoli. Others wondered at the relative value and morality of arming civilians - something not recognized by the Geneva Convention. The fact that Special Operations Executive (SOE) HQ took some of its ideas from the IRA's efforts in Ireland emphasises that those seen as brave Resistance fighters might be viewed as "terrorists" through a different lens. Having seen how the Germans handled "francs-tireurs" in 1870 and 1914, no one supposed that the Nazis would be less ruthless. 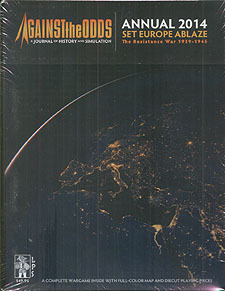 Set Europe Ablaze captures the spirit and complex choices involved in Occupied Western Europe. Award-winning designer John Prados (Beyond Waterloo) brings us a card-driven game pitting the occupying Axis forces against the combination of Allied intelligence efforts and brave local citizens, fighting the shadow war that made the Maquis a name to remember proudly. This package includes an extra-large magazine and the complete game, using large full-colour, die-cut counters. The game's main focus is not on movement and combat by military units but on political-economic strategy. The Axis player wants to extract as much raw materials and finished goods as possible, to aid the war effort. The Allied player employs various tactics that include sabotage, interdiction, and intelligence gathering. Axis responses include partisan sweeps, counterintelligence operations, and labor pool mobilization to repair damage. SAS units, Jedburgh teams, and the OSS compete with the Abwehr, Gestapo,, and Vichy police. Turns abstractly represent variable time periods, with rounds within each turn varying according to cards played. While there is no "combat" in a literal sense, there are competitions for resolving actions that have both players rolling dice. Excitement levels will be high, as players wonder what the next card will bring!